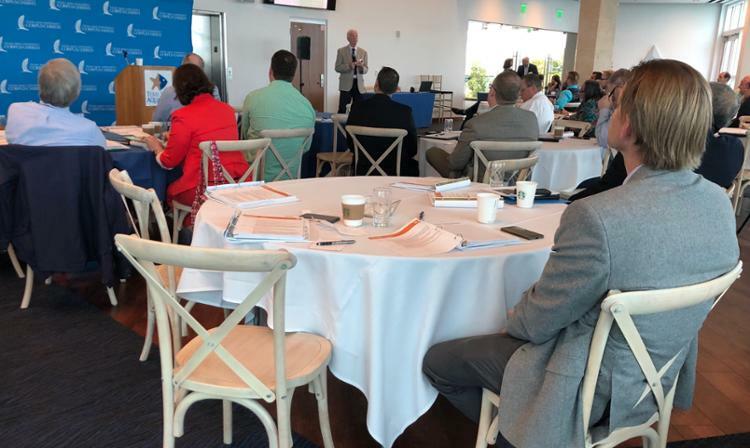 Coastal Bend leaders attend the second Connected Coast Summit Series to discuss rebuilding communities affected by Hurricane Harvey. CORPUS CHRISTI, Texas – Many community leaders from the Coastal Bend struck by Hurricane Harvey are looking to rebuild their economies and infrastructure with greater resiliency. To help meet this need, The College of Business (COB) at Texas A&M University-Corpus Christi is hosting a series of summits, called The Connected Coast, bringing in experts targeted at coastal communities’ needs. The first summit held in Rockport last fall focused on broadband technology. The second summit was held in Corpus Christi in November addressed restoring infrastructures such as water and roads. “We brought several experts to the table from strategic partners at the Center for Infrastructure Renewal at the RELLIS Campus because they deal a lot with materials and next-generation items,” said Russell Franques, Director of the Coastal Bend Business Innovation Center at Texas A&M University-Corpus Christi. Experts including Zachary Grasley, director for the Center for Infrastructure Renewal at Texas A&M University, discussed retrofitting and building resilient structures and homes, water security, and sustainable communities. James Kaihatu, civil engineering associate department head at Texas A&M University, shared research on building communities in a smart and eco advantageous manner. “If you’re able to rebuild using the natural resources you have (in Corpus Christi) as a means to help suppress some of the unwanted effects of the storm, and you use that as part of your coastal defense system… that would be something that can be used to a community’s advantage,” he said. Franques also discussed upfront costs and investments that are initially high but will have a great benefit in the long-term. The third summit is planned for Thursday, Jan. 31 and will focus on Innovation of Technology, and the fourth will be on Risk Mitigation and Preparedness. All the summits are in-line with economic recovery goals as defined by the Economic Development Administration for long-term economic development and resilience planning.